According to her mother, the young girl was tackled and handcuffed after watching police kill her 12-year-old brother. Cleveland, Ohio – All month, we have been reporting on the story of a young boy named Tamir Rice who was shot and killed by a police officer while playing in a park with a toy gun. As more details about the incident surface, the situation has become more and more disturbing than police initially described. This week, Tamir’s mother, Samaria Rice has spoken out at a press conference, saying that not only was her 12-year-old son shot by officer Timothy Loehmann, but her 14-year-old daughter was immediately detained, handcuffed and thrown in the back of a police car. At the press conference on Monday, Samaria Rice said that when she arrived at the scene of the shooting, she found her 14-year-old daughter handcuffed in the back of a police car. The girl was apparently handcuffed because she “refused to calm down” at the sight of her little brother just getting killed in front of her. When Samaria rushed to her dying son’s side, police told her that she had to back off and calm down or she would be arrested. According to the family’s attorney, Benjamin Crump, they are making a formal request that the prosecution skips the grand jury process and immediately press charges against the officer responsible for the murder. “We don’t need to have another grand jury. There is nothing written in the law that police officers should be treated differently from other citizens. It’s an unwritten rule we’ve accepted. You can charge the officer,” Crump said. 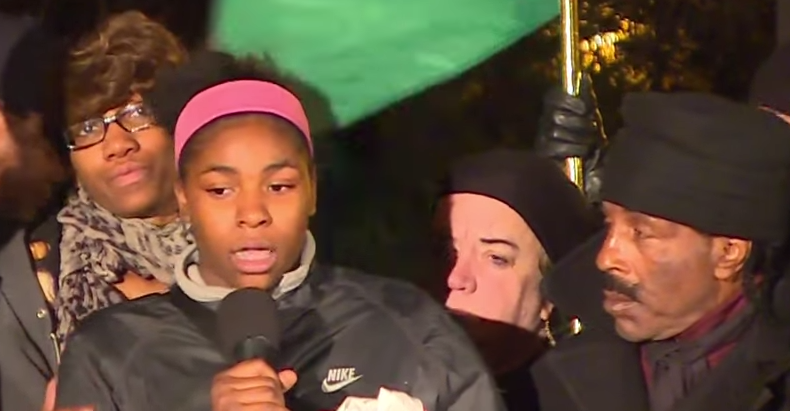 “The family is focused on getting justice for Tamir. They’re very concerned because they look at what happened in the [Eric] Garner case, where there was no indictment when a man was choked on video … They are very concerned about local prosecution,” Crump said. The video footage to surface after the incident showed absolutely no restraint on the part of Cleveland patrol officer Timothy Loehmann, when he fired the shot that killed young Tamir Rice. A quick look into the history of officer Timothy Loehmann, shows that he has a short and troubled past with police work. In fact, Loemann was actually terminated from his last job as a police officer, because they did not think that he was mentally capable, or mature enough for the job. He was let go by the City of Independence Police Department in December of 2012, and then was quickly rehired with the Cleveland Police Department in March of this year.